Research shows that your teeth can speak volumes to your overall health. We take the dental care of your pet seriously. We recommend regular at home dental care including: brushing, chews, rinses as needed. Often this is not enough to keep gingivitis, and calculus at bay. We recomend dental cleanings as necessary to maintain the health of your pet. 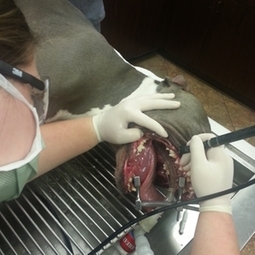 Pets will not cooperate for us to do a full dental exam and cleaning of the entire mouth. We must provide general anesthesia with proper monitoring to ensure the safety of your pet. During this exam your pet's teeth are scaled, polished and examined for any issues. Extractions (tooth removal) may be warranted if any teeth are severely diseased or damaged beyond repair to prevent further disease, pain and suffering.